I grew up learning about the Three Sisters of the Iroquois: corn, beans and squash. Interplanted and intertwined, they sustained the people physically as well as spiritually. Corn, tomatoes and watermelon are my contemporary triumvirate: the Three Sisters of Summer. For days they’ve dominated my menu. Ironically all three reach their peak of perfection just as summer slips out of our grasp — officially, this very weekend. I have an insatiable sweet tooth which means I should love watermelon, but I’ve always found it cloyingly — gaggingly — sweet and sugary. If you’ve got a serious sweet tooth, it doesn’t seem possible that anything could be too sweet, but there you have it. When I was growing up my mother made watermelon pickles and I couldn’t get enough of those. I would sit and eat a jarful if she wasn’t watching. The sweet sour combination of flavors made watermelon palatable — though, of course, pickling destroyed the ruby color. 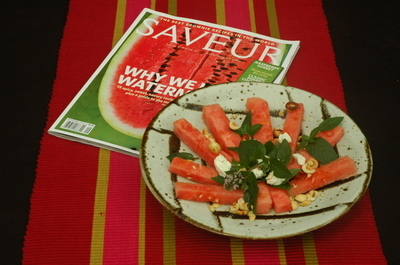 The newletter went on to offer two recipes for watermelon salads: “Watermelon, Arugula, Red Onion and Feta Salad with Citrus Vinaigrette” by John McReynolds, co-owner and chef of Café La Haye in Sonoma, California and “Watermelon and Goat Cheese Salad” from John Clark of Foreign Cinema, San Francisco. The recipes turn watermelon into a food for grownups. 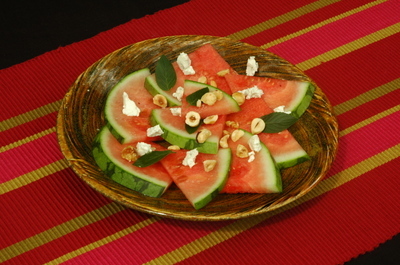 The addition of spices and savory flavors cuts the sweetness and turned me into a watermelon fan. You can still find the recipes at DWR but the photos of the two dishes are long gone. And now Saveur magazine offers even more imaginative ways to think about the fruit in their September 2008 issue. “Why We Love Watermelon” offers 15 recipes from around the world and a guide to the different varieties. The very first recipe takes John McReynolds salad ingredients and adds mint, parsley, kalamata olives, and jalapeno pepper to the mix. Now we’re cookin’! Well, actually, that’s the beauty of dishes using watermelon: cooking is rarely required. Both views are my versions of John Clark's watermelon salad. The title of this post is taken from Richard Brautigan's fanciful 1968 novel of the same name.